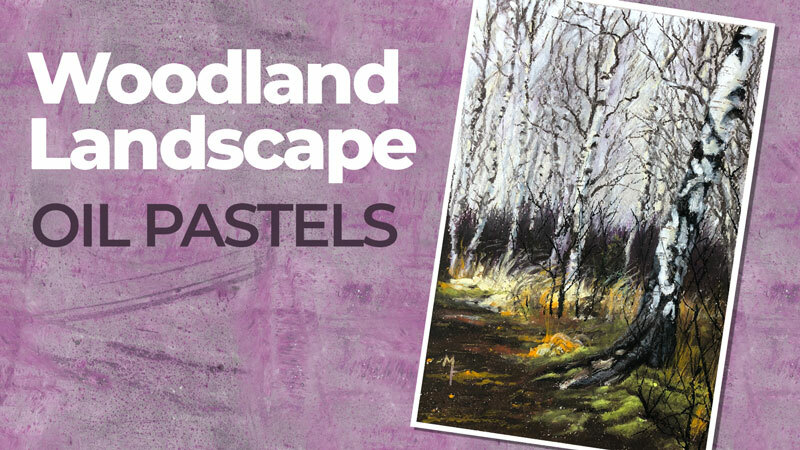 Learn how to create an Impressionist landscape with oil pastels. Make use of a color triad with secondary colors to add a bit of expression to this beautiful landscape scene. I’m sure we’ll go back to Thursdays again in the future. Comments! woo woo woo!I’d be really happy to Thursdays We miss yall. Hi Matt! Absolutely loved the color theory live lesson. Yes, please invite Ashley again – you guys were a great tag team! While watching this Oil pastel lesson, I was wondering if you had ever considered taking a reference subject such as this forest scene and doing a series of live lessons with each medium, using the same photo reference. It could be a great way to appreciate the differences between each medium and provide a comparison between them. We don’t begin the same way in building up our image or colors from one medium to the other (watercolor, dry pastels, oil pastels, colored pencils – they all have their own sets of rules). I think it would be interesting – especially for newbies – to see the evolution of an identical subject using each different medium. I realize that this could be a lengthy process, so I suppose a simple and smaller image would still allow to showcase each different medium. What do you think? I think is a good idea! That would certainly be interesting and possibly encouraging for those who are using a different medium, getting a different result, and getting discouraged. What a great idea! This sounds like a course to me! I like this idea because I often go back and forth with different medium. I like the idea too. In fact, some time after Matt critiqued my acrylic painting of the monarch butterfly in the field, I re-cropped the photo reference (as he suggested in the critique) and “painted” it with pastels. I needed a time lapse between the pieces so I could look at the reference afresh but it was fun and I learned from it. It would be fascinating to see how different mediums might capture the same image – when done by someone who knows what they are doing! Boy, you guys are good! What a great idea! This is something I’ll consider as a course most likely. Thanks for your reply Matt. I am looking forward to seeing your take on this. I like this idea, because when I saw this reference photo, I thought, “Hey, this may be a good subject to try my new Graphitint pencils on! May have to also use some watercolor, but I think most can be done with Graphitint. Hi Matt I loved this lesson. I’m blown away so far and we just started. I’m back after 11 months of illness. Due to circumstances I’m still a beginner. This lesson is way above my pay grade – meaning I’m still in the graphite world. And may well be for the foreseeable future. I love your lessons. This is so kool and something to look forward to. It is now Feb 13th 2019. A lot to do. Keep the learning coming………. A book I have suggests cooling the surface of the image with an ice pack (covered with a towel of course) before covering a previous color application with another when you don’t want the underlying color to show through.